HypeKON is coming for real this year ..
Love hearing "B.I proposed, YG accepted". As it should be. Hope YG keeps to his timing tho ugh, cause delaying this means longer waiting for group cb. So I guess this means we won't get another iKON (full group) album in the first half of this year. yasss!! Give me more ikon! Double B album MY HOPES AND DREAMS HAVE BEEN ANSWERED. 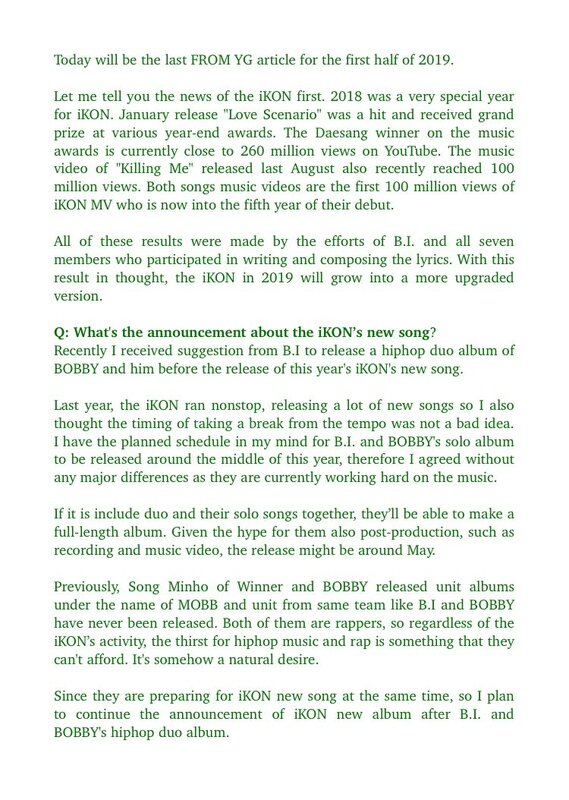 I'm thinking Hanbin was supposed to have his solo album but he's not yet 100% ready & chooses to do it with Bobby first. I'm hyped but I REALLYYY wish that the other members will have their own solo promos too in the mean time. YASSSS, FINALLY DOUBLE B AGAIN!!! I WANTED MORE AFTER ANTHEM.